According to many experts, this environmental disaster will cause the whole ecosystem of the central sea area to be severely damaged and it will take several dozen to hundreds of years to recover. According to a brief report of Dan Viet and Saigon Giai Phong, coral reefs in the waters of Quang Binh were completely destroyed. 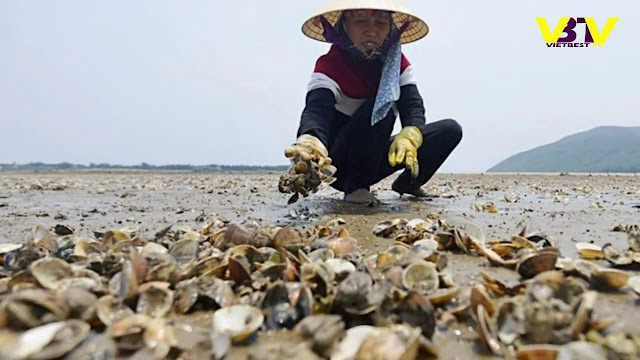 There is no scientific guarantee that the sea is safe except for the unfounded statements made by some leaders such as Truong Hoa Binh and Mai Tien Dung. Repeatedly, there are suspicious red marks appearing around the Vung Ang area near Formosa. In an independent study, the Green Trees, an environmental group, issued a test of seawater from the Ky Ha seashore in Kyushu in February 1974, indicating toxicity is very dangerous. Most recently, on 4/4/2017, a suspicious reddish patch of water appeared at the Vung Ang jetty just in time for a central environmental inspection mission in Formosa. As soon as receiving compensation from Formosa, the government announced that it would use the proceeds to clean the sea. However, a year has elapsed, and no information has been confirmed that the government has taken steps to restore the marine environment. The handling of dead fish at the coast as well as the handling of thousands of tons of contaminated seafood in frozen warehouses is also extremely weak. Hundreds of tons of dead fish are buried only through manual methods. Most of the contaminated seafood is not destroyed properly and scientifically. According to an article in Dan Tri and the Solidarity, hundreds of tons of jellyfish stored in frozen warehouses in Thach Kim and Thach Bang communes are now smelly, but the authorities still do not guide and assist people to destroy it safely. These damaged jellyfish is smelly, affecting the health and morale of the local people. The fishermen also confirmed that the number of fish and shrimp in the sea they catch has decreased significantly compared to the previous year. There is no specific research report on this issue, but with the number of dead fish not only washed ashore last year but also died in the seabed, the decline is highly likely. After a year had gone by, environmental hazards have not only not been resolved, but fears continue as Formosa continues to operate. As expected, when put into production, the amount of waste pouring into the environment will be many times greater than the test run polluting in 2016. Provinces of Ha Tinh, Quang Binh, Quang Tri, Thua Thien-Hue and Nghe An all reported their own damage with very large numbers. In the report at the People's Council meeting, Dang Quoc Khanh, Chairman of Ha Tinh People's Committee announced that GDP growth was at -17.06%. For a province where budget revenues in 2015 are more than $ 10 trillion, this is a catastrophic figure. The growth rate of Quang Binh was only 4.2% against the target of 8%. For Quang Tri, the report put forward a monthly loss of 98 billion VND. Thua Thien Hue reported a loss of 988.5 billion VND. Nghe An, a province not compensated by the Government Decision, also proposed a VND 415 billion support. At present, with the concern about food safety and hygiene, the price of aquatic products compared to previous year, only ½ makes the profit from fishing and aquaculture while tourism and sea trade is still in a very poor condition. Other marine related professions also continue to be affected. According to preliminary statistics, the number of unemployed is 40,000 people, of which Ha Tinh is 24,500 people. The government intends to send the population to work abroad. However, the export of labor is difficult because many labor export markets such as Korea and Taiwan are limited because of the high number of export laborers who stay away. Therefore, people seek to cross Laos and Thailand labor underground. State media reported that by the beginning of 2017, the number of people in Nghe An and Ha Tinh provinces who flocked to acquire passports have increased, numbering to more than 500 people per day per province. The economic impact of the Formosan catastrophe will not only take place in 2016, but will inevitably affect the next few years. The socio-economic reports of the central provinces and the country in the quarter 1/2017 compared with the same period last year were down sharply. It is clear that the Formosa disaster was caused by the management, licensing, and operation of the central and local government. However, the lack of transparency and ignorance, together with the mishandling of personal delinquency caused delays showed signs of protection, has led to the belief towards the leadership of the Communist Party of Vietnam. The disaster started in early April last year, with much information from the people and the press. On April 12, Dang Ngoc Son told the press that eating fish is still safe while in the midst of the mass death of the fishes. On April 27, 2016, Mr. Vo Tuan Nhan, Deputy Minister of Natural Resources and Environment, responded that the cause of the mass death of the fish was due to red tide. On April 28, Chu Xuan Pham, Deputy Director of External Relations of Formosa Ha Tinh, answered Lan Anh, VTC14 reporter saying "Picking steel or picking fish?" These two events have caused public outrage. A series of protests took place in Hanoi, Saigon, and Nghe An. To make matters worse, these protests were faced with drastic repression in Hanoi and Saigon. Instead of focusing on Formosa, protesters rushed in reaction to the government as they said the government was lacking transparency in dealing with disasters and covering up Formosa. On June 30, 2016, the government announced that the main culprit was Formosa Ha Tinh, which had polluted the ocean. At the same time, the government claimed to receive $ 500 million in compensation from Formosa. This statement has made the public outraged again because they think that the disaster settlement cost would be at least several hundred billion dollars and the amount of $ 500 million is too little. This response is well founded when Prime Minister Nguyen Xuan Phuc's year-end report shows that the disaster has lost 0.3% of GPD. With about $ 200 billion in GDP in 2016, the annual loss of $ 600 million is greater than the amount received by the government from Formosa. At the same time, not to mention the amount of compensation for the people, the administrative costs to serve the compensation process, the cost of cleaning the sea as well as the damage continues for the following years. The $ 500 million received by the government from Formosa became an offensive topic and talk from the public when the government did not take into account the entire damage as well as the consultation of the people and the experts. People became skeptical about the state's ability to lead when it received too little money for a serious law offense, then commits little of it, and then brushes away responsibility. After receiving money from Formosa, the government announced that it would complete the compensation for residents in August 2016. However, the promise was moved to October, then December, and now the promise continues to 6/2017. The process of compensation is very slow and people in many places claim that the compensation is unfair causing chaos to local villages. A series of continuous protests have been held continuously since October until 4/2017. People quickly and promptly demanded compensation in Quang Trach (Quang Binh), Ky Lo, Ky Ha, Ky Phuong, Ky Nam (Ky Anh district, Ha Tinh). Many times stalled for several hours. The commune, district and provincial administrative organs are almost gathering people for compensation every day. The situation is so serious that Dang Ngoc Son, vice chairman of Ha Tinh province, had to issue a written request and blame the district and commune for not allowing people to pull up the PPC for money. However, complaints and grievances have not diminished despite the fact that the local media reported that people agreed with the compensation. On 3/4/2017, thousands of people in Thach Bang and Thach Kim communes (Loc Ha district, Ha Tinh province) took over Loc Ha district People's Committee to claim compensation. That same day, people in Ky Phuong, Ky Nam (TX Ky Anh) protested and blocked traffic on Highway 1A for over 6 hours in Deo Con area, Ky Anh. Meanwhile, the opposition who are complaining about the compensation will continue to increase because of the inability of the administration to handle a dialogue with the local people. Meanwhile, Nghe An, a province not included in the government compensation list, supports requests from the central level to the central government were not approved. Affected fishermen who received no compensation. Therefore, they initiated a lawsuit against Formosa Ha Tinh to the United States Courts in Texas where Formosa is located. However, the authorities sought not to accept this lawsuit. 506 of the people of An Hoa commune (Quynh Luu) were returned by the court for no good reason. More than 1,000 other residents in Quynh Ngoc, Quynh Tho and Son Hai communes (Quynh Luu) were arrested on the way to Ky Anh to file suits and were suppressed by the government.